Label Rouge is a French quality mark in the field of animal welfare. 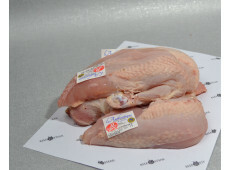 The Label Rouge chicken is therefore a Boerenscharrelkip, with spout. Our French farmers want to preserve the quality of chicken by keeping slow-growing chicken breeds. The chickens get at least 81 days to reach their final weight. With 11 chickens per m², these chickens have a lot of space and they can go outside, with an outflow of 2 m² per chicken. Special requirements apply to animal feed, such as at least 75% grains in food. This has a favorable effect on meat quality. Label Rouge Chicken Breast Supreme.